The retina is the light sensitive tissue that lines the back of the eye. The very center of it, which allows us to see fine details and colour is called the macula. Occasionally, one might develop a macular hole, which is a small defect into the center of the macula. This in turn causes blurred and distorted vision whilst the peripheral vision remains intact. Macular holes occurs approximately twice more frequently in women than men. People over the age of 60 are more frequently affected. There is approximately 15% lifetime chance of developing the same condition in the other eye. Although the majority of the cases are idiopathic (i.e. there is no known reason for the development of the macular hole), there are cases that can be linked to trauma, short sightedness and previous retinal detachment surgery. What is the treatment of macular holes? The treatment of full thickness macular holes is surgical and it is successful in restoring the macular anatomy in over 90%. The functional success of the surgery (the visual improvement) depends on the duration and the size of the macular hole. The operation is called pars plana vitrectomy and can be combined with cataract surgery. This involves removal of the vitreous (the jelly), peeling a very fine layer from the retina (the internal limiting membrane) and inserting a special gas bubble. Patients are then asked to position face down overnight, no additional posturing is required. Whilst having the gas bubble in the eye (which lasts for approximately 4-6 weeks, and gets spontaneously absorbed), the patient would have poor vision in the operated eye and should not fly. Following the surgery, patients are also given some postoperative drops to use for approximately 4 weeks. The surgical procedure is usually performed under local anaesthetic as a day case, which means that the patient is fully awake during the surgery and can go home afterwards. A local anaesthetic is injected around the eye and for the duration of the surgery the patient is asked to keep still and lie on his/her back. The average time of the procedure is one hour. Alternatively, the surgery can be performed under general anaesthesia, the patient is asleep; however that might require further investigations to assess the patients’ general health. Full thickness macular holes can very rarely close spontaneously over time even if no surgery has taken place, this can lead to a visual improvement. However, in the majority of patients the central vision will remain poor and may further deteriorate. 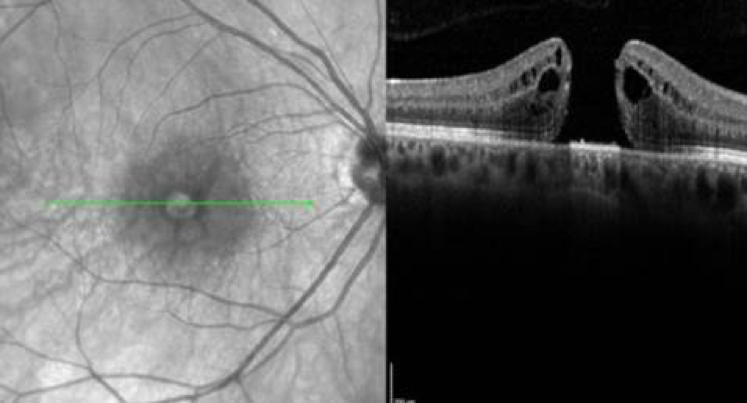 Macular holes affect the central vision only therefore the patient can still have good peripheral vision.